If you happen to be extra adventurous, Rafting Tour in Marmaris might actually be one of the best choices that you should try when you visit Marmaris. The way to the rafting location by itself is a fantastic experience. The spectacular landscapes you will see are going to be distinct from anything you have witnessed before. Twisting hill roads, woods of pine, amazing sights, and the tales you will hear from the guides are going to keep you rejuvenated. The complete Marmaris Rafting Tour from pickup to drop off will take around 9 hours, and should you depart early on, at around 7:30 am from your hotel, you are likely to return by 18:30 pm, leaving you free to eat an evening meal in the city and unwind after having a long day. 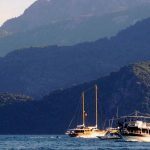 A shuttle is going to collect you from your hotel early in the morning to get you to the location on the banks of the Dalaman River. This could be a one and a half hour trip, and the location is a raft centre in Akkopru village. First among the list of activities to do is a quick briefing session to acquaint yourself with the activities you are going to be participating in shortly. The guides are going to show a video so that you can understand and picture the experience you will have. Following the screening, the shuttle will get you to the river, to the place to begin rafting. It’s a location overflowing with vacationers and natives who’re warm and friendly. At the beginning point, you will have further practical instructions which the instructors will provide you with, including how you can raft, how to be careful, the basic safety measures, and some other aspects of standard process. In teams of 6, people can jump into the rafts, in addition to a guide each, and start paddling along the river. The initial step of the voyage is going to be fairly quiet, and is best used for rehearsing the managing of the raft. The landscapes around are pretty remarkable. Remember to swim and loosen up. The second half of the journey is where you are going to come across rapids and wilder torrents. Should you have rafted in the past, this is when all the fun begins. For newbies, the guides are going to assist in managing the waters. Once you get to the finish line, a tasty meal will be awaiting you.